Performance artist Serge Attukwei Clottey is best known for his work with the yellow plastic jerrycans that are typically used to collect and carry water. He calls this technique "Afrogallonism". His performance installations are intended to highlight Ghana's soaring levels of pollution and to draw attention to social injustice. Serge Clottey received international acclaim long before his work was celebrated at home. Following in the footsteps of his artist father, Clottey trained in Brazil to become a performance artist whose work is often met with great puzzlement and curiousity in Ghana. 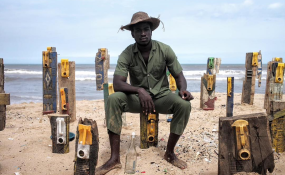 Not only does the artist create tapestries and sculptures made of jerrycans or, as the locals call them, "Kufuor gallons" to provide social commentary but he also uses his own body, in performance, to try and bring together disparate and competing ideas. In Ghana jerrycans play a vital role in transporting water in times of drought but leave behind an environmental catastrophe once the drought ends. They lie discarded by the side of the road, on city dumps and beaches, or they are washed away by the rains to gather and clog up the country's drainage system. Clottey's aim when he uses the jerrycans in art installations is to raise awareness of this crisis and to rouse local communities into action. He cuts the jerrycans into small tiles and shapes them over an open flame, then molds the different sections together before binding them with items like copper. He also incorporates other salvaged waste items such as discarded electrical goods or wood, bones and shells. The end result are large tapestries that the artist calls "paint-less paintings". "People do not care to listen to how they should use less water or waste less. Children are not educated about global warming in school, and they are not inclined to take action about the issue," Clottey continued, outlining his desire to use his plastic installations as agents of change. In the La district of Accra you will find a distinctive-looking road: It is carpeted with giant yellow plastic tapestries, making it resemble the fictional "yellow brick road" of Wizard of Oz. Clottey periodically carpets the road in what he described to BBC as "a rebellion against the country's property rights". This is a reference to the fact that many poor communities cannot prove land ownership due to a lack of proper documentation. As part of the project the artist recruits locals to help collect the Kufuor gallons. About 3 000 jerrycans have gone into the yellow brick road project since it began in 2016. Clottey's workshop weighs and pays US$3 (£2.30) for every kilogram collected, which encourages cleaning-up efforts and provides revenue opportunities. The artist is set to complete the project in 2020, after clearly marking an area in the district that he claims belongs to his family. Aside from his sculptures and tapestries, Clottey and his collective, "GoLokal", use their bodies to create discourse on pertinent issues. "I used to work as a model," he told the Guardian. "To work in the arts you have to find a way to make money, but I was also interested in how modelling can manipulate the way you move. When I realised that I could also use that body in my work, I already had an audience of people who were interested in me as a model." These performance installations have included "The Displaced", in which the GoLokal collective stood on Labadi Beach, with fishing nets covering their bodies, enacting the trade and migration story of the Clottey family, and "African Electronics", in which GoLokal paraded through the streets of the Jamestown district wearing costumes made from suits, cameras, cassette tapes, ceremonial robes, body paint, rope, fabric and - predictably - yellow jerrycans. "African Electronics isn't about electronic gadgets, but about the minds behind those inventions; about individual power," said Clottey. "In Ghana we use animals, plants, nature, to heal ourselves, to communicate our spiritual problems, and that is very powerful. I grew up in a religious family but I'm now growing more spiritual by accepting our traditions." The traditions were the driving force behind another installation, "My Mother's Wardrobe", in which he puts on his deceased mother's blouses and bags to walk the streets of Accra in protest at Ghanaian funeral rituals. These rituals dictate that a mother's belongings remain locked away for a year after her death and are only then given to the women in the family. This was untenable for Clottey, being an only son, with no sister to inherit his mother's belongings. This left him in danger of losing these memories to distant female relatives. "I wanted to enact my relationship with my mother but also to point out this imbalance," he explained. "I could feel her presence very close up - the clothes had her smell." His troupe joined in and helped drive the social commentary: "Gender roles are very limited in our community but we all felt very comfortable in those clothes," he observes. While Ghanaians may not always understand his message, his tactics have proved successful in creating dialogue in his community and is on course to lead to tangible change someday.